There are two Wu styles (often referred to as Wu and Wuu). They are quite different but, due to the ambiguity of the English language on tones and such points, we group them together for easy reference - we hope. Here are two styles often prized for their practicality, medical benefits, ease of performance and generally high degree of concentration and control. 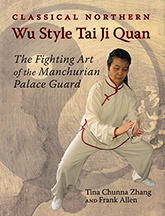 A major book for anyone studying Taiji or even just Chinese Martial Arts. This is the husband wife team who excelled for decades in the art of Wu style Taijiquan. Here are some of the major promoters of the style for the twentieth century. This book covers a wide variety of topics including history, stances, the solo form, push hands etc. Direct descendents familially and technically of Grandmaster Wu Chian Chuan (1870 to 1942) these teachers taught for many decades. They include discussions on internal practice, give notes on the meaning and history of the names of the moves. Besides attractive illustrations the book shows a photographic section with move demonstrated by Wu Chian Chuan himself and then the forms shown by Wu Ying Hua. Some of the Tai Chi classics are reprised and breakdown on the types of Push Hands is shown. An important book. To our mind this is one of the best T'ai Chi books in any language - plain and simple. Wang brought a tremendous teaching ability and insight together to produce what should be a template for martial writing. Not only does he explain the movements of his 37 Wu Style form (one of the best abstractions in Tai Chi) but he shows the usage of the moves and discusses such things as which acupuncture points should be stimulated and even what the feeling of each move should be (ache here, twist there). Other sections are translations of his teacher Yang Yun Ting's note and an interview with Wu Tu Nan, the longest playing Tai Chi student in the world. See Wang's Biography. Also some VCDs by Wang himself. See a Chinese Language version of this book. 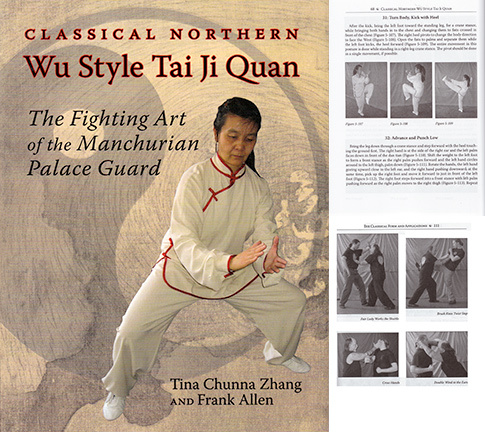 From the jacket: "While other well-known tai ji styles branched off into sports, health, and meditation, Wu Quan You's disciples have preserved the traditional practice methods and forms. In this book, Tina Chunna Zhang and Frank Allen explain the principles, characteristics, and essentials of the Wu method, detailing the direction, intent, breathing, and internal principles of all 324 segments of the 83 postures. Step-by-sep photographs and instruction in forms practice, fighting applications, push hands, and weapons skills illustrate the entire classical form." In addition: The classical Wu style sword form with breakdown. Check out this volume and other "hurts" for discounts. if you ever find this item. Noted to many people, especially in the New York area, as a leading proponent of the Eagle Claw, Leung Shum is also a dedicated Tai Chi practitioner. His specialty is Wu Style slow form which he demonstrates fully in this text. 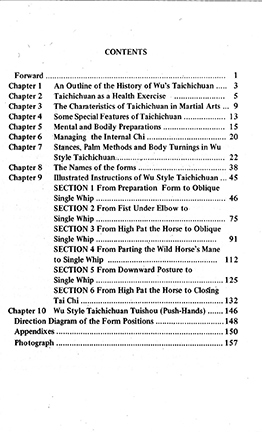 Dr. Yang JwingMing adds to our knowledge by translating many of the documents of T'ai Chi particularly in this text regarding the Wu style. This Wu Style was Yang BanHou's famous student Wu QuanYou (1834-1902) and passed on to his grandson Wu Gong Zao, author of the text. Yang here also adds commentary to help the scholar of Tai Chi better understand these significant documents. An appendix adds writing by Xiang KaiRan. This is a work books on the Push Hands of the Wu style. What can we say? There are so many stories of Master Ma throwing people this way and that it appears he was the possessor of superlative skills. Wu style had always had the reputation of being strong in this area and here is a breakdown of the patterns and variations inherent in the practice. This book is not always easy to get. The explanations are pretty complete but, as any text might, it suffers from the difficulty of trying to convey this complex subject matter through the written word. Nonetheless, this borders on being a collector's item recording the moves and patterns of a man famous for his Push Hands skill. 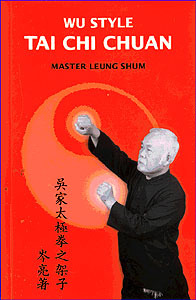 The author started his Tai Chi training in 1933. After initial study he began training directly under Wu Chien Chuan, son of the Wu founder: Wu Chuan You. Mr. Lee himself if quite accurate and a bit dapper (with bow tie). The photography is rough but manageable. 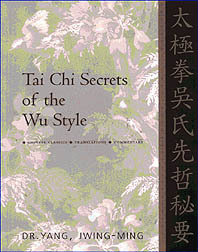 This was one of Unique's first books on Tai Chi and, at the time, it was rare to find anything in English on the subject of Wu style. A good reference with history (using Cantonese name equivalents), basic principles, the form and other information. Originally published in 1982.